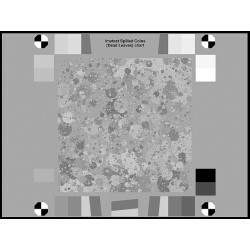 The updated Imatest Spilled Coins Cross test charts use cross-correlation calculation texture metrics to provide improved stability for images with nonlinear noise reduction. Users can now more accurately differentiate between noise and texture. Random/Dead Leaves Cross, which runs under the interactive Rescharts interface, measures SFR (Spatial Frequency Response) or MTF (Modulation Transfer Function) from random scale-invariant (or approximately scale-invariant) test charts, including “Dead Leaves” and “Spilled Coins” charts. Contrast of the pattern reflectance range is 3:1, with 18% gray background as per the CPIQ new standards. 8 Registration marks are placed around the active area to attain a more accurate transformation between the reference image and the test image. 16 grayscale OECF patches are included for linearization prior to texture response calculation. The chart contains slanted edges (2:1 and 4:1 contrast) for convenient comparisons between Texture MTF and slanted-edge MTF. 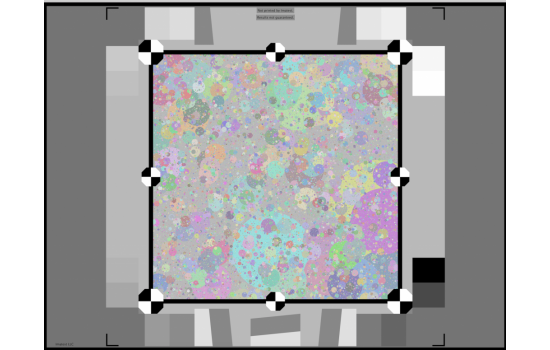 Backwards Compatibility: The chart maintains flat areas of the same mean reflectance as the pattern on either side of the center area, used for Noise Power Spectral Density estimation in the classic “Direct” Texture MTF method supported by our other charts. Pattern design is more uniform, i.e., is more shift-invariant than other vendors’ Dead Leaves charts. Read more about Random/Dead Leaves Cross chart analysis.